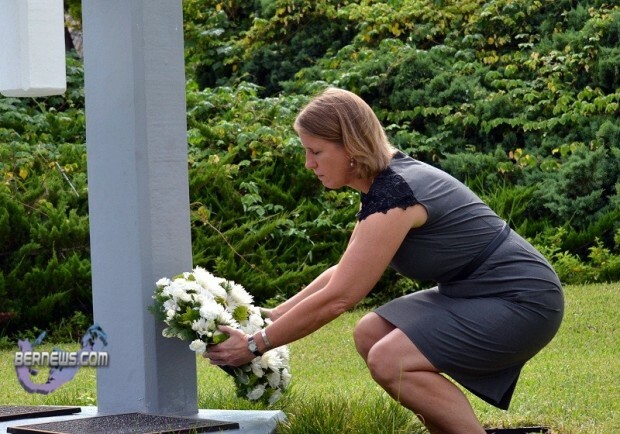 Earlier today [Sept.11] U.S. Consul General Grace Shelton visited the 9/11 memorial in the Botanical Gardens where she laid a wreath and observed a moment of silence. 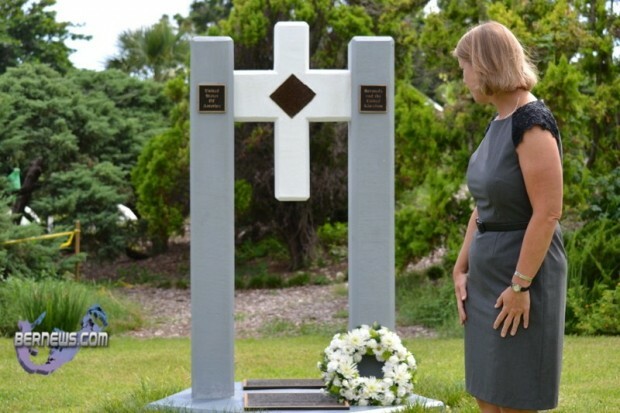 Ms Shelton then attended the 9/11 memorial service hosted by the Right Revd. Patrick White at the Anglican Cathedral at 4:00 pm, where she participated in the service along with Premier Paula Cox and Acting Governor David Arkley. The personnel of the U.S. Consulate will continues to observe the 10th anniversary of 9/11 on Tuesday, September 13 by planting a rose bush on the grounds of the consulate commemorating those lost in the tragedy. 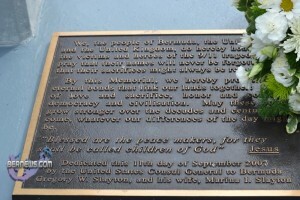 The memorial located at the Botanical Gardens was made at the Bermuda College, and dedicated in 2007 by then-U.S Consul Gregory Slayton. It includes two grey towers to represent the Twin Towers and a five-sided base to represent the Pentagon. The diamond shaped object in the centre of the white cross is an actual piece of the Twin Towers, provided by New York Mayor and part time Bermuda resident Michael Bloomberg. Click the photos below to enlarge and read the inscriptions on the memorial. Ten years ago today, there were four coordinated attacks on New York City and Washington, D.C. 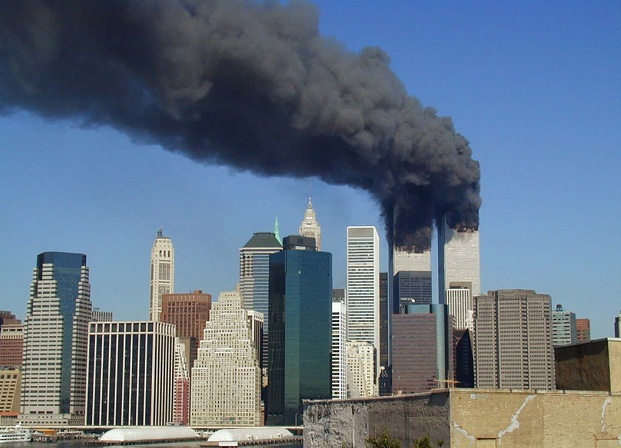 The hijackers intentionally crashed two planes, American Airlines Flight 11 and United Airlines Flight 175, into the Twin Towers of the World Trade Center in New York City; both towers subsequently collapsed within two hours. Hijackers crashed the third flight – American Airlines Flight 77 – into the Pentagon in Arlington, Virginia. The fourth jet, United Airlines Flight 93, crashed into a field in Pennsylvania, after passengers attempted to take control before it could reach the hijacker’s intended target in Washington, D.C. Nearly 3,000 people died in the attacks, including two Bermudians. Bermudian Rhondelle Tankard had only been working in the World Trade Center for two days when the attacks occurred. The 31-year-old former Warwick Academy student had just been seconded from Aon Bermuda to their New York office. 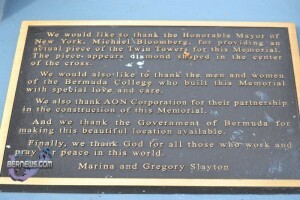 “It is particularly appropriate to join these two actions in that Rhondelle was the first Bermudian to join AON’s Reinsurance Division in Bermuda and due to her continuing achievements and education was on a short secondment to our World Trade Centre office in New York at the time of the 9/11 tragedy. Fellow Bermudian Boyd Gatton also perished in the Twin Towers. 38 years old at the time of the attack, Mr Gatton was working as an operations manager for a company located in the World Trade Center. His fellow Saltus Grammar School schoolmate, U.S. national Robert Higley, also died in the attacks and the school will pay tribute to both former students tomorrow. GOD BLESS THEM ALL AND THERE FAMILYS!!!!!!!!! !